'A Bomb Has Been Dropped' On Birmingham, Mayor Says After Storms : The Two-Way "You're talking about whole neighborhoods of housing just completely gone. Churches, gone. Businesses, gone. I'm not talking about just roofs being blown off, but just completely gone," says Mayor William Bell. Dozens of deaths have been reported. 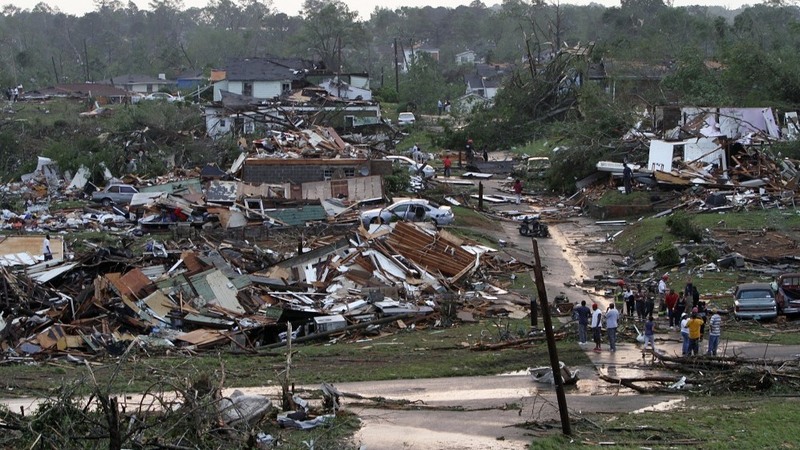 Residents survey the destruction after a tornado hit Pratt City, Ala. just north of downtown Birmingham, Ala. on Wednesday, April 27, 2011. Of the many places pummeled by tornadoes the past two days, Alabama is where the greatest number of deaths have been reported as of this hour. The Birmingham News says at least 128 people were killed in the state. And the death toll is likely to go higher. More than 30 deaths occurred in Birmingham. -- The Pratt City area of Birmingham has been "totally devastated [and] several other surrounding neighborhoods ... have also been heavily damaged." -- "You're talking about whole neighborhoods of housing just completely gone. Churches, gone. Businesses, gone. I'm not talking about just roofs being blown off, but just completely gone." -- The heavily populated area, "seems like a bomb has been dropped on it." -- "Where buildings once stood, toothpick-sized wood shreds are there now."